Clearly, ordinary humans were incapable of containing the atomic genie. Popular culture began to depict the bomb as a monster on the loose. 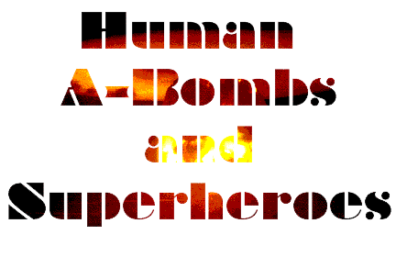 Human A-Bombs such as these could be defeated only by the superior powers of comic book superheroes, providing a comforting psychological barrier between the reader and the atomic menace. A more common theme had the hero deriving his super-powers from atomic power, as in the case of Atomic Mouse, who energized himself by eating uranium 235 pills much as Popeye fortified himself by munching cans of spinach. Radioactivity had been touted as invigorating since the discovery of radium, and science fiction writers had promoted the notion that superior beings would evolve from radiation-induced mutations, but these ideas found their most striking and long-lasting home in the comics. 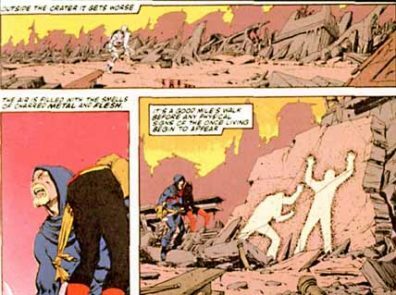 The crime-fighting heroes in this 1988 comic gain their superpowers through the exposure of their parents to the radiation of the Hiroshima bomb. 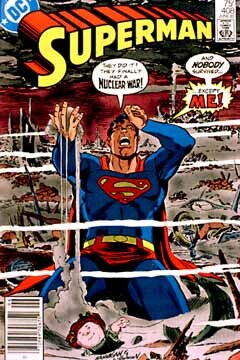 When in 1985 Superman confronted the threat posed by the nuclear arsenal, the disaster depicted on the cover turned out to be only a nightmare, but the Man of Steel was unable to solve the problem definitively. In recent decades it has become apparent that there are no easy solutions to the nuclear menace. 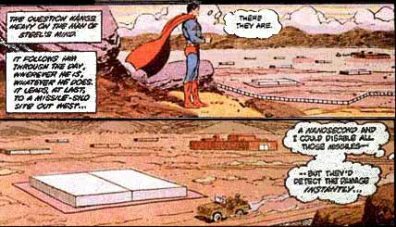 Superman’s only solution in this story is to raise the next generation to be less hostile and violent. You may recognize a close similarity between this story and the plot of the 1988 film, Superman IV: The Quest for Peace. Such protection as most contemporary superheroes can manage is dubious and limited. The superhero is barely able to preserve himself and his companion. “It’s still yet another two miles before Vanth sees his first body. The children are the worst to look at.